The outpost at Port Lockroy, a sheltered harbor on Goudier Island off the Antarctic Peninsula, has been designated a Historic Site and Monument (No. 61) under the Antarctic Treaty. It is one of the now 85 historic properties that dot the vastness of Antarctica, where 98% of the continent is covered in ice. These sites recognize where adventurers, exploiters, and now scientists, have left their mark. And the adventurers are still coming. In 2014 over 37,000 tourists made the trip to see the continent’s amazing scenery and wildlife. Many also make a stop at Port Lockroy to see Gentoo Penguins, Skuas, a variety of seals and the only museum on the most southern continent. Named in 1904 by the French explorer Jean-Baptiste Chacot, the harbor provided his expedition with a life saving refuge for ship repairs. Whalers later used the bay as a place to resupply fresh water and through the 1920s as an anchorage for their floating factory ships. No permanent occupation was made of the harbor until toward the end of World War II. 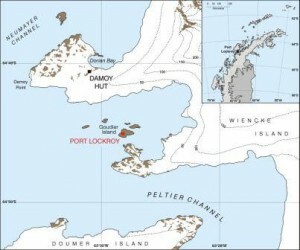 In 1944 British concerned about global security launched Operation Tabarin, establishing what became known as Base A at Port Lockroy. A headquarters building was constructed with a two-room bunkhouse, known as Bransfield House, and was staffed by up to nine men. With the end of the war the objective of the base shifted from national security to a program of scientific research. Work at the site was carried out by the Falkland Islands Dependencies Survey, later renamed the British Antarctic Survey. Research included meteorological observations and groundbreaking sounding of the upper atmosphere (the ionosphere) Port Lockroy was a key-monitoring site during the International Geophysical Year of 1957/58. In 1962 Base A was officially closed and the buildings were left as emergency shelters. 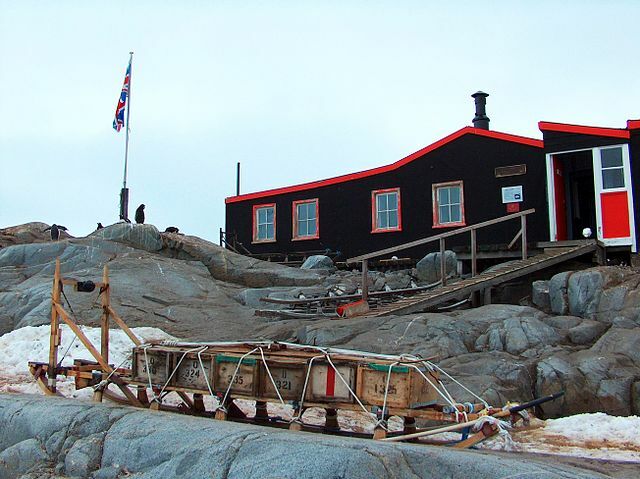 Today the site is the flagship property of the United Kingdom (UK) Antarctic Heritage Trust. In 1996 the Trust restored the main building and now manage it as a museum and a post office. The interpretation of Bransfield House provides insight on what life was like on the base in the 1950s and its scientific mission. Visitation to the site is under strict treaty guidelines to protect both the wildlife and the historic resources. The Trust fields a four person staff during the Austral summer November through March. They will be recruiting in May of 2015, so for those who are really intrigued keep checking the web site under jobs. The Antarctic Treaty was signed in 1959 to reduce the conflict of competing national claims of ownership and use of the continent. It sets aside Antarctica as a scientific preserve, establishes freedom of scientific investigation and bans all military activity. The treaty and its Protocol on Environmental Protection are implemented by the signatory nations. Today, the treaty has been ratified by 51 nations. Antarctica, the most unsettled and inhospitable of lands, is the only continent without a native human population. Its wilderness and scientific values are incomparable. However, the glimpse provided by Port Lockroy and the other 85 historic sites and monuments are a telling perspective on the continent as a cultural landscape. Illustrating the very human urge to explore, to map, name and claim features of the region – to leave their stamp on the land and to try and understand. The Antarctic Treaty is often acclaimed as an example of the successful implementation of the principle of international law that recognizes the common heritage of mankind. The concept that holds certain places should be protected from exploitation and held in trust for human generations. Port Lockroy is one small chapter in a success story demonstrating that nations can work together to preserve our common heritage. For those who cannot make the trip, enjoy this wonderful presentation.